I’m a fairly normal person. Or at least I would like to think I am a fairly normal person. My nearest and dearest may disagree with that. But I can (usually) get myself ready to face the world with some semblance of normalcy. I can usually dress appropriately. I almost always have my teeth brushed and my hair beat into submission before I go out in public. I usually have on a matching pair of shoes. Usually. So what’s my excuse here? 1) I was a little late leaving to meet M for lunch. M and I, as you know, have been meeting for lunch since the late 70’s. A long time. M’s lunch time is a little restricted. I don’t like to be late because it cuts into our chat time. 2) When I get home at night, I often kick my shoes off in the closet by the front door because I never wear shoes when I don’t have to. I was running a little late because I’ve been running a little late ever since the demise of the clock that runs my life my treasured mantel clock, and the phone rang. It was a short call, a call to let me know that my new (old) clock was ready to pick up. I was now a little further behind. I hurried from the kitchen carrying my purse, a knitting bag, the box to mail to my Sockapaloooza pal, and a jacket I had picked up but not put on. My arms were full. I could barely open the front closet door. I fished blindly around with my feet until I found a pair of shoes. Out the door I went. M and I met and settled ourselves in to our accustomed table in our accustomed restaurant. Judy…, said M. Are you wearing a matching pair of shoes? I was on a little bit of a tight schedule. 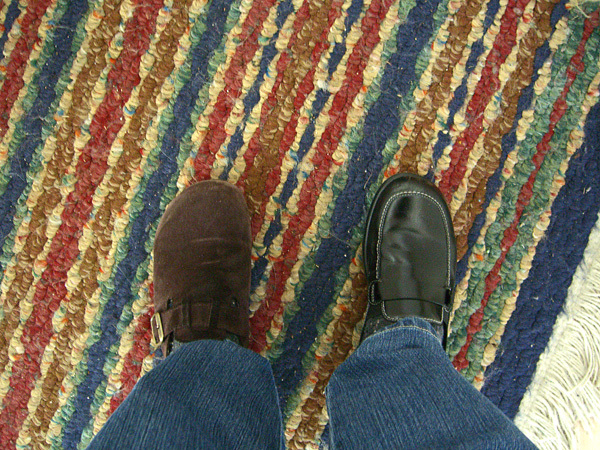 In my mind I ran through all of the places I was going to have to visit before I could go home and put on a matching pair of shoes that actually looked the same. But I took comfort in the fact that I was not likely to meet anyone I knew in any of those places. For example, in all the years that M and I have been meeting for lunch, I’ve never seen anyone out there that I know. I left the restaurant, and there across the parking lot was someone I know from work. Someone in a higher position than mine. Someone who needs to see me as a competent, take-charge sort of person. We waved at each other across the parking lot while I attempted to keep at least one car between us. No go. We had parked next to each other. I don’t think my feet were noticed. I hope not. And I hope the people at the post office didn’t notice. Or the bank. Or the clock repair shop. I will hopefully be on time now. Or at least I have a better chance of being on time. The new (old) clock is now gracing my mantel, chiming out the hours. It’s a Gilbert. Made some time between 1890 and about 1920 (I don’t know enough about clocks to get closer than that). Lovingly restored in 1980 and sitting since forlornly on a shelf waiting for a new home. I loved it at first sight, even before I learned anything about it. I think it was waiting for me. Note to self: Look at feet before leaving the house.